Wow, Monday already! I have to say I’m liking the time change! It’s so nice having the sun last longer. That means Barbecuing after work, working in the garden and go for a nice walk after dinner! Yah!!! To celebrate this loving time of year I made for you Chocolate Cake in a mug. This Monday is the Secret Recipe Club assignment. I was assigned Corina’s blog, Searching for Spice. I saw so many wonderful recipes like Mexican Chicken Stew, Fennel Salad with Sea Bass and Black Bean Sweet Potato Soup. But when I saw Corina’s Chocolate Cake in a Mug, I just had to give it a try. This is one food recipe I have had on my bucket list and now I get to make it and share it with you. I did modify the recipe a tad bit to healthify it. The original recipe called for 3 tablespoons of cooking oil, but I decided to try applesauce instead. I also added a pinch of vanilla extract, since I am a vanilla freak! Plus I topped my cake with strawberries and a cake isn’t a cake without some kind of frosting or whip cream, plus sprinkles. It’s so cute, I can’t stand it!! I have to say I am pretty impressed with this cake. I made it in myBIG, oversize latte mug because I was afraid of it exploding in the microwave and I have the tendency to make everything over flow in the microwave, so I played it safe with this recipe. No mess, but my cake fell a little flat compared to other cake in a mug recipes I have seen. I also under cooked it by about 20 seconds or so on purpose, so I had a super moist cake. The cake is a mix between chocolate cake, chocolate pudding and chocolate lava cake all in one! It was light, moist, chocolaty and super delish! I haven’t had chocolate cake in a long time and this was a treat!! My Husband took a bite and thought it was yummy too!! This being a portion control recipe is perfect for me because if I were to make a whole cake, I would eat the whole thing. That is why you don’t see to many cake recipes on my site! 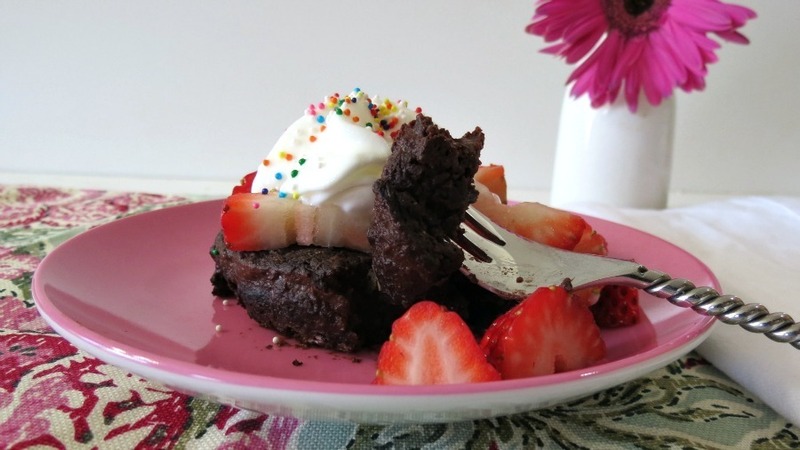 A rich, moist healthy chocolate cake, made in a matter of minutes int he microwave. Perfect for your chocolate cravings. Mix all the ingredients together in a mug. Place in the microwave and cook for 50 seconds to 1 minute 30 seconds. The cake is done by the firmness of the cake. Thank you Corina for sharing the Chocolate Cake in a Mug, now I get to have my guilt-free cake for dessert! I love it!! You Guys should totally check out Cornia’s blog, Searching for Spice. There are so many great recipes on there!! Also, be sure to check out the other Secret Recipe Club Recipes! This is the best way of presenting Chocolate mug cake i had ever seen.. Its really tempting./tab. I’m so glad you liked this and I love the variation of using apple sauce instead of oil. I’ll have to try that myself next time. I bet that would satisfy my chocolate craving I’m having at 9:30 am. LOL! Great SRC choice! So simple! I love the healthy portion controlled dessert. Perfect for when I NEED chocolate and the hubs wants vanilla. i’ve generally avoided the mug cake before because there’s no doubt I would make it every day…and it’s pretty high calorie! But here you are to the rescue! This looks temptingly good, beyond self-control good, and you make it sound almost guilt free! Yum. I’ve never made any cakes or the like in a mug before! I think something needs to change that… this is so convenient for those of us who don’t have much self control! Girl, I used to make these when I was little, but they never turned out like this!! Choco, strawberries, and cream. It just doesn’t get any better than this! Love it! 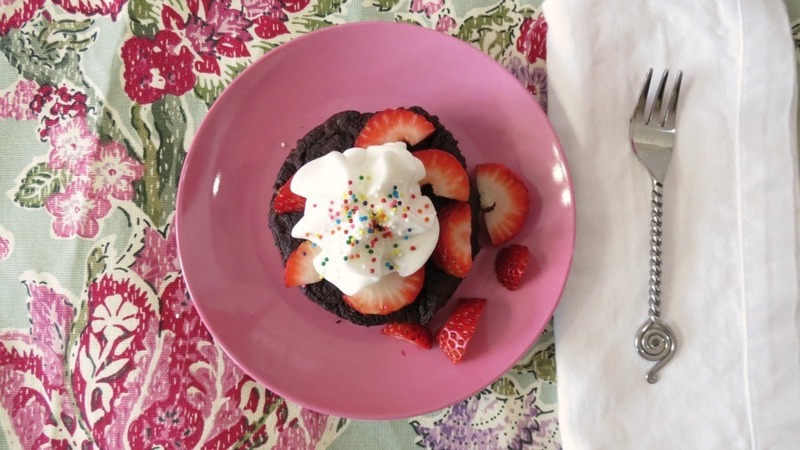 I love a Mug Cake and this recipe looks very good. Thanks for sharing a awesome recipe! I have to try this. Amber would absolutely think it is so cool!! I love these quick minis. When I made one, I was surprised at how good it tasted. This is a great choice. I love microwave mug cakes! Especially since they’re single serving. Yours looks so good and fudgy! I’ll definitely have to try it. Yum! I absolutely LOVE mug cakes, I even have a whole board dedicated to them on Pinterest 🙂 This is one of my favorite recipes – http://blogs.babble.com/family-kitchen/2011/09/13/two-minute-mug-brownie/ I learned a trick to avoid the mug cakes from turning spongy and less cake like is to watch them really closely and check on them before the cooking time is up – like you said about taking it out 20 seconds early. I’ll have to check out your board! This was this first time I ever tried this and i love it!! Oooh this cake looks so yummy! 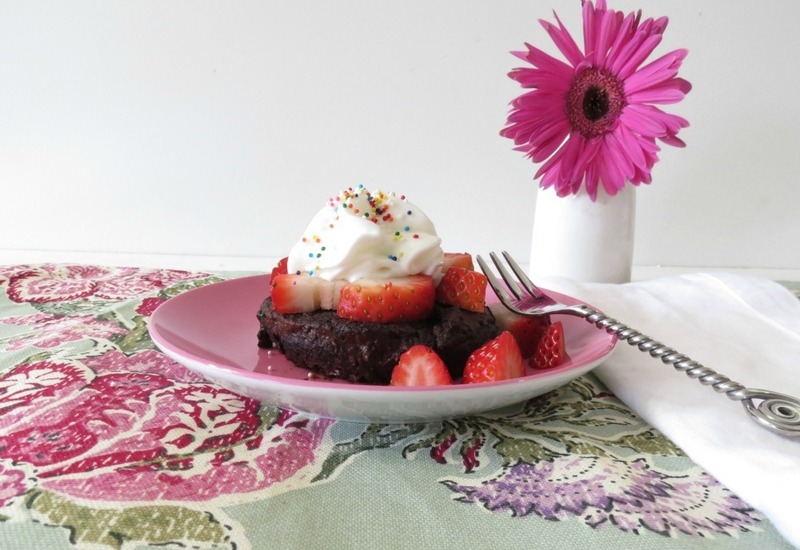 I love chocolate cake, and I love that this is so easy to make! I love that it’s easy to make too!! In a couple minutes you can have cake, all I need is some ice cream! 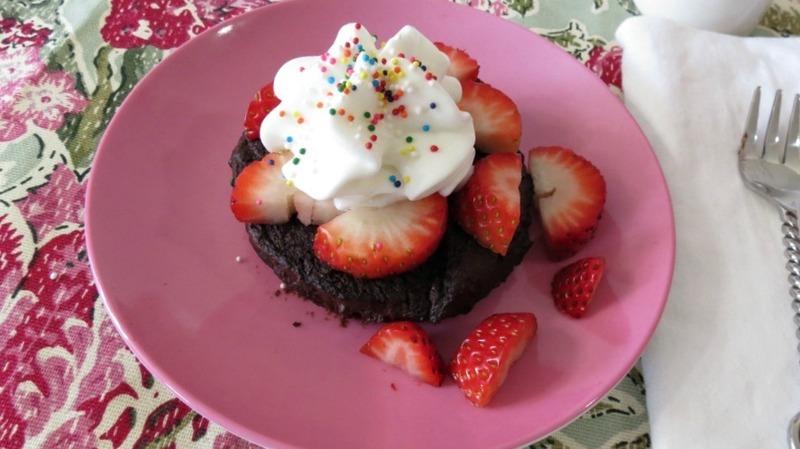 Love the individual mug cake and adding fruit–yum! Glad I was assigned your blog and got to discover it before you switched groups! 😉 I just found some unsweetened coconut in the cupboard (thought I was out) and came to get that recipe for the Raw Almond Joy Balls. Must make soon. Katrina, your cookies look amazing that you made! Love the idea of being able to eat an entire cake! Looks delish. If you haven’t already, I’d love for you to check out my group ‘A’ SRC entry Loaded Potato Soup. Me too!! he he 🙂 Thanks for the invite, I’ll check it out! I love that you substituted applesauce for the oil – and that you kept it nice and moist in the middle! I have made a couple of mug cakes, but I always worry about “messing” with the recipes with the microwave cooking method… but it’s good to know that you can do it and have such awesome results! Great job! Sounds great – chocolate cake, chocolate pudding and chocolate lava cake all rolled up in one! Thanks CJ! Love this little cake, perfect for an after dinner dessert. Hi Beth! Any kind of flour will do! Let me know how you like it! Hi Kristin!! Nice to meet another fellow SRC member! You have to make cake in a mug, it’s so good and so easy!! Love that I can have cake in a matter of minutes! 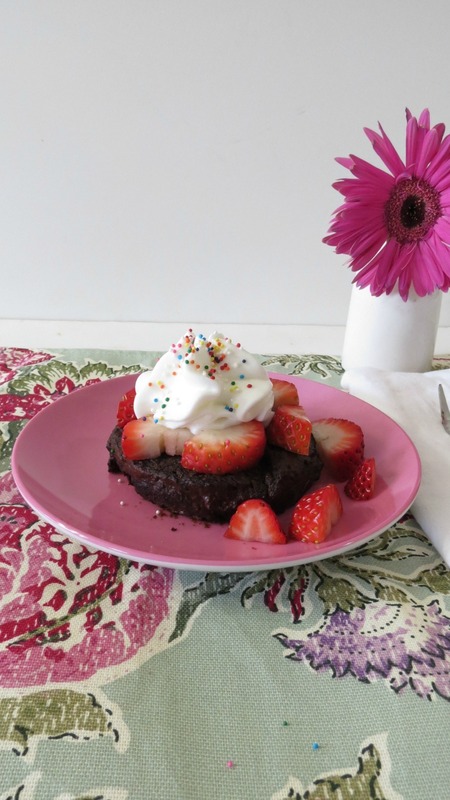 I just made this as my first ever mug cake – thank you – it was SO GOOD!! !